...I guess I'm an exfoliating nut. Alerted to a website called Trouva & their beauty section, I took an interest in this Meraki Scrub. The no frills packaging designed by Scandinavian aesthetics and free of Parabens, Colorants, Endocrine disrupting substances. I found interesting as endocrine is a group of glands that produce hormones that regulate metabolism, growth and development, tissue function, sexual function, reproduction, sleep, and mood, among other things, having certain ingredients in products can cause disruption and unfortunate long term affects on our body. Within the ingredients it does have ground walnuts, which have hard shells but they give the smoothest results on skin as they're ground down to fine particles, sterilized and packaged up. You can always see the light brown particles within the scrub being that they are very hard they don't break down within the scrub. With them being so hard they'll give an effective exfoliation it is noted that this scrub isn't safe or to be used on the face and I believe it's due to the fact the walnuts are hard and the face and especially the delicate eye area it'll break down the skin. When someone strokes my skin - not a regular thing - I like that they compliment that it's smooth and soft. I put it down to dedicated exfoliation & natural homemade moisturiser. Now you should know by now I love a coffee scrub, wooooo! *ric flair voice* but it's not ideal for everyday because it's a dampen skin, rub down skin, let it dry for about 10 minutes, rinse. So...need something that's more that on the go. Ingredients : Aqua, Sodium Coco-Sulfate, Acrylates Copolymer, Cocamidopropyl Betaine, Juglans Regia Shell Powder, Sodium Hydroxide, C12-15 Pareth-12, Sodium PCA, Sodium Levulinate, Potassium Sorbate, Farnesol, Limonen/d-Limonene, Linalool. 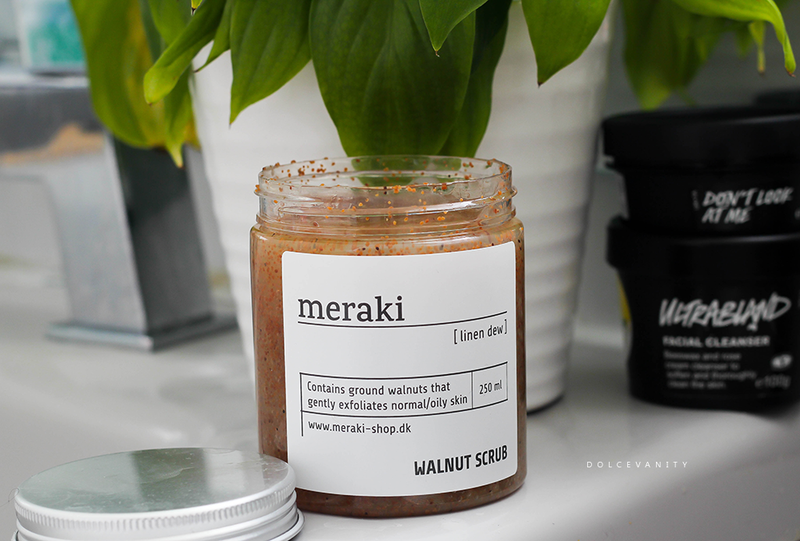 Enter...Meraki Linen Dew Walnut Scrub with it's slight minty aroma. I noticed it has Juglans Regia Shell Powder which is a soft walnut shell powder,that they've immersed in the fatty acid from coconut oil. The texture is a watery gel consistency, once on the skin it's gliding and helping o move those walnut shell particles. Bottom line, it's effective, doesn't dry out the skin, keeps it a little hydrated most of these ingredients are natural making it all good for the skin. It's £15.50 for 250ml, has a bit of a price tag on it but then I purchase coffee scrubs for around the same cost. Tried a walnut scrub before? I like a walnut scrub much better for the environment than microbeads. This scrub sounds and looks so nice! I'm a sucker for nice scrubs so I'll be looking into this really soon! Whitney xoxo | Whitney Loren. I love scrubs like this, and they always make my skin feel amazing after. The packaging is really nice, too, I'm loving this minimal style at the moment. Never tried a walnut scrub before but would definitely love to one day, it looks amazing. I've not tried a walnut scrub before but have seen a few around now. This one looks lovely (almost good enough to eat in that packaging!) glad to hear you enjoyed using it. This sounds like a really great product. I need something like this in my life. No I haven't tried this sort of scrub before but I want to. I love scrubs but never tried yet the walnut.This looks like worth to try. I love scrubs and this one looks great! I will have to purchase it soon! I have never tried a walnut scrub before but it is interesting to know more about endocrine, I had no idea so many products used it.